All the quick bathroom organization projects I’ve done over the years have added up to a huge difference in the functionality of our spaces. Most of them only took a few minutes, so they are a great topic for today’s Fast Fix Friday! Here’s a quick video of my favorites and all the details are below that! 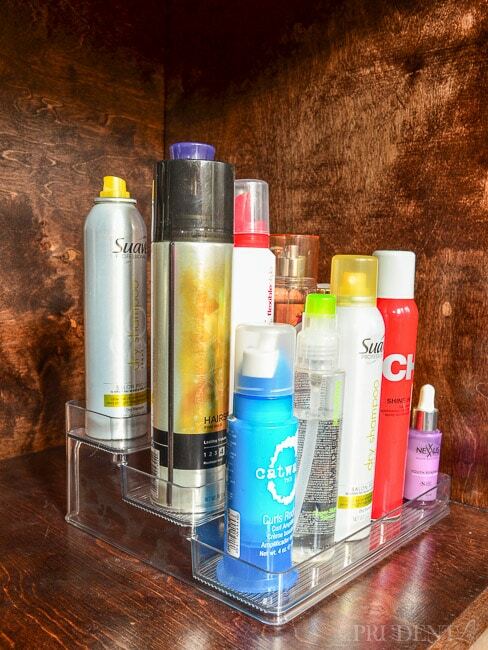 Fix #1: Add a Tiered Spice Rack to keep beauty products contained, yet easy to find. I used mine in the cabinet, but it would also work on the counter. 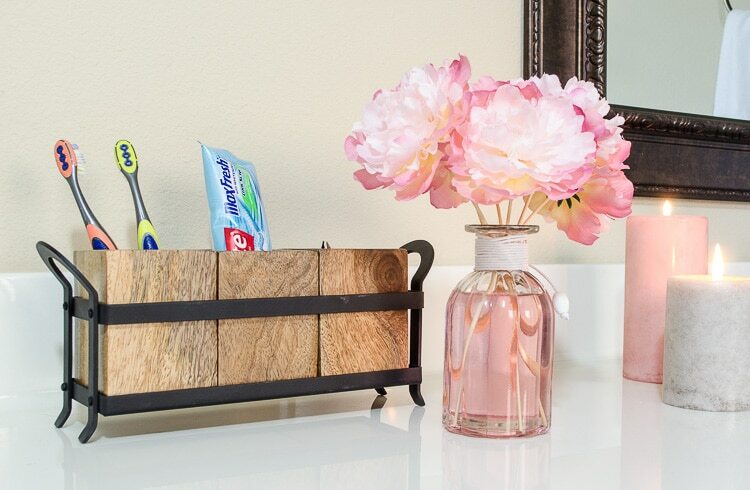 Fix #2: Use a Utensil Caddy from the kitchen on the vanity for cute storage. They’re great for everything from dental gear to make-up brushes in the bathroom. 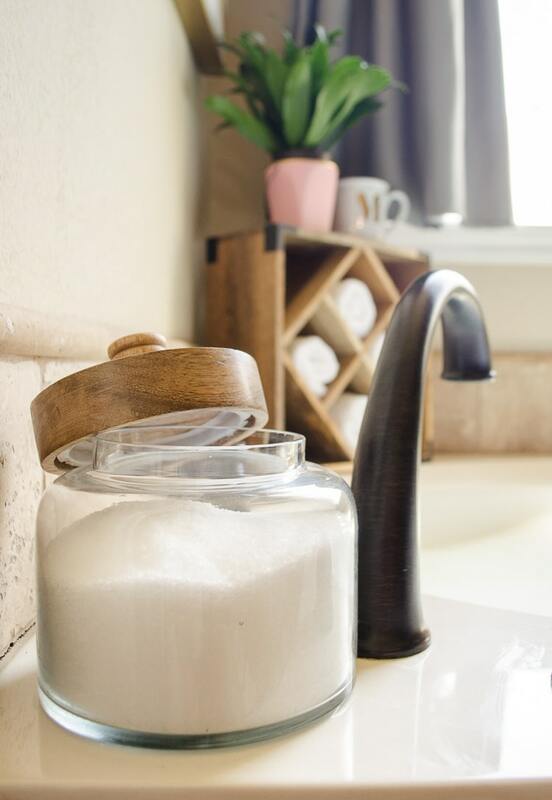 Fix #3: Dump Epson/bath salts into a pretty jar for an instant upgrade! The more affordable ones always come in ugly bags that create ugly clutter. My jar seems to be discontinued now, but Amazon has some pretty options! 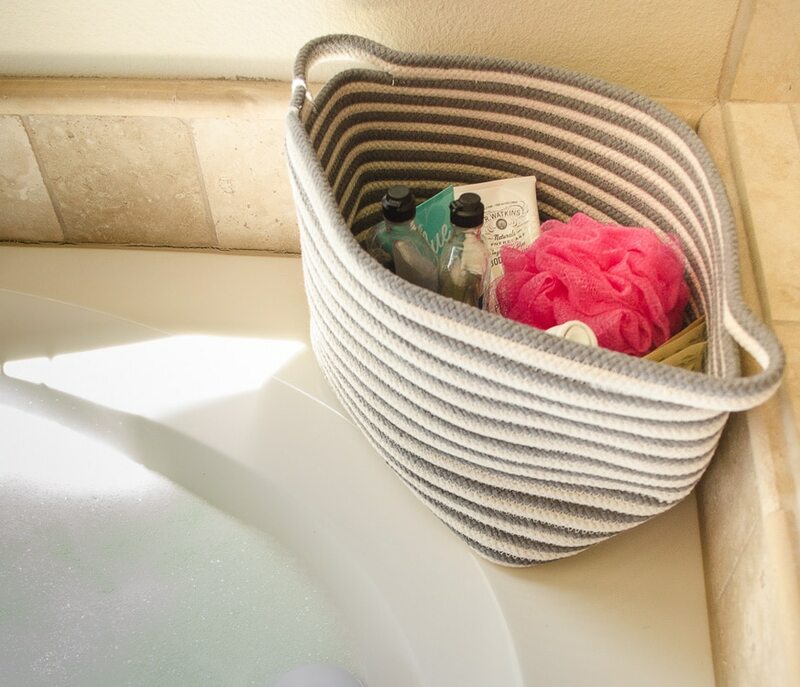 Bonus Fix: If you have more room on the tub, a wine rack makes a great washcloth holder. You can see mine in the background of the photo above. Fix #4: Baskets, baskets, everywhere! I don’t know what took me so long to realize that I should be hiding things in baskets in the bathroom. I had just enough room to add one to the corner of the tub, and it hides bubble bath, razors, shaving cream and so much more! I used another basket for all the hair styling tools. As soon as they cool down, they get dropped into the basket. In the photo below, the basket is tucked into a bar cart, but I’ve also had it on the vanity between the sinks. 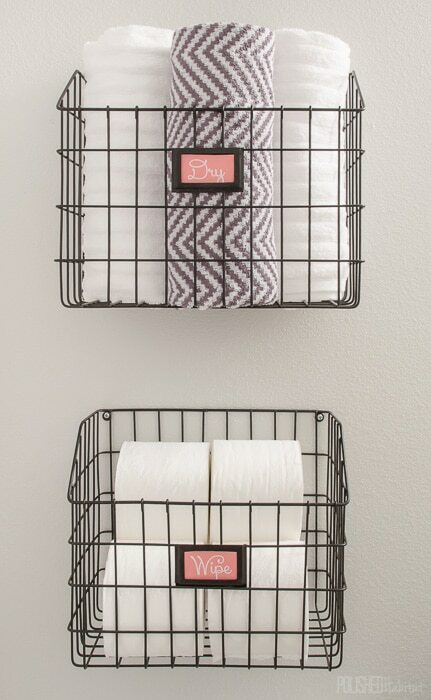 In the guest bathroom, we used wire baskets on the wall to hold the towels and extra toilet paper. Fix #5: Use those walls & cabinet doors to store more! My jewelry is in the closet, but this idea would work great in the bathroom as well. 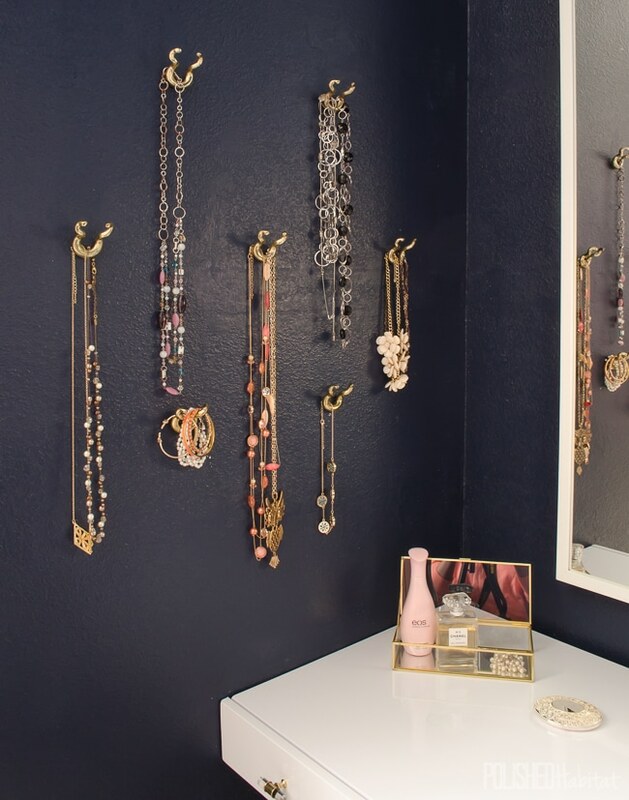 Add small coat hooks right to the wall to hang necklaces and bracelets. 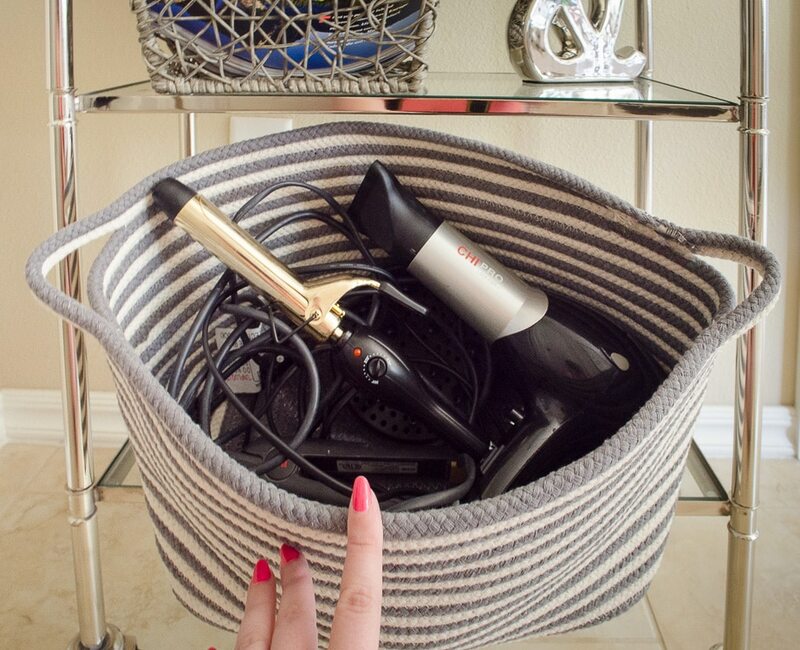 You’ll be able to find what you need quickly and they won’t get tangled in a drawer! 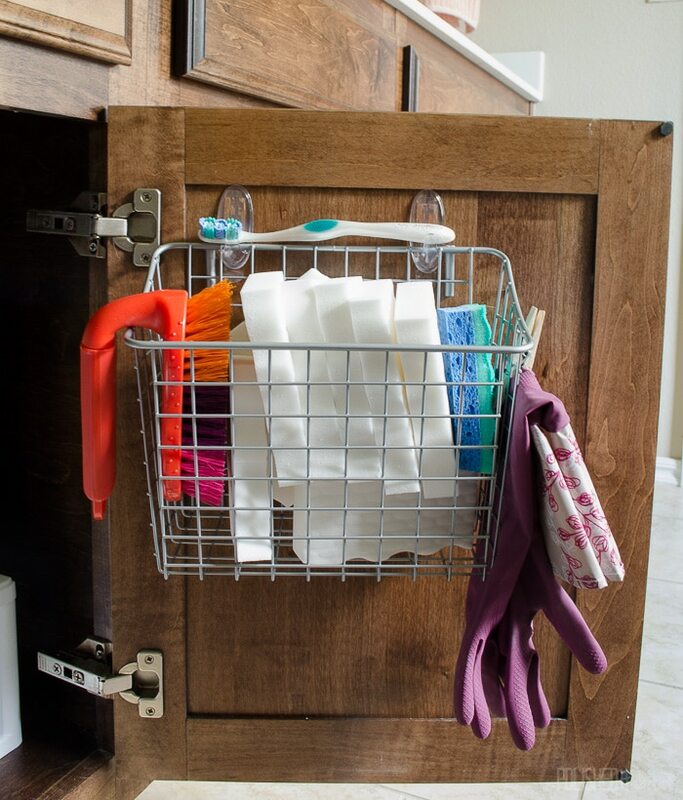 Command hooks & strips are a quick and damage-free way to hang baskets and bins on the inside of your cabinet doors. I hope you’ve got some new ideas and are inspired to tackle any problem spots in your own bathroom this weekend. 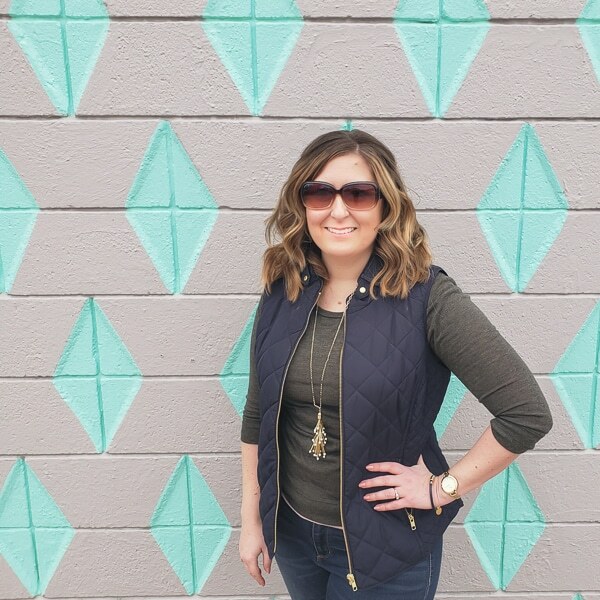 Let me know if there is something you’re struggling to organize that I didn’t cover, because if you’re struggling, there’s a great chance someone else has the same issue! 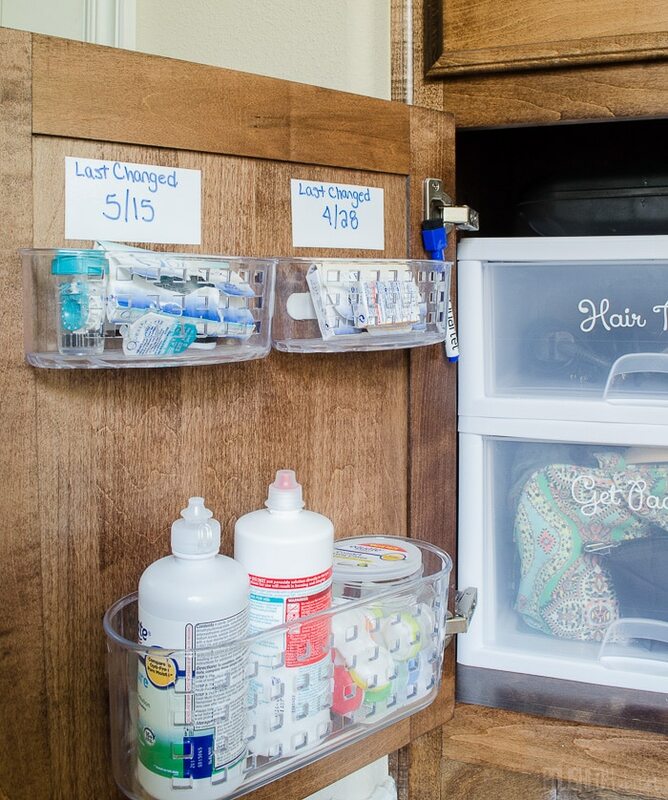 Here’s a list to ALL my bathroom organizing posts so you can find exactly what you need next! 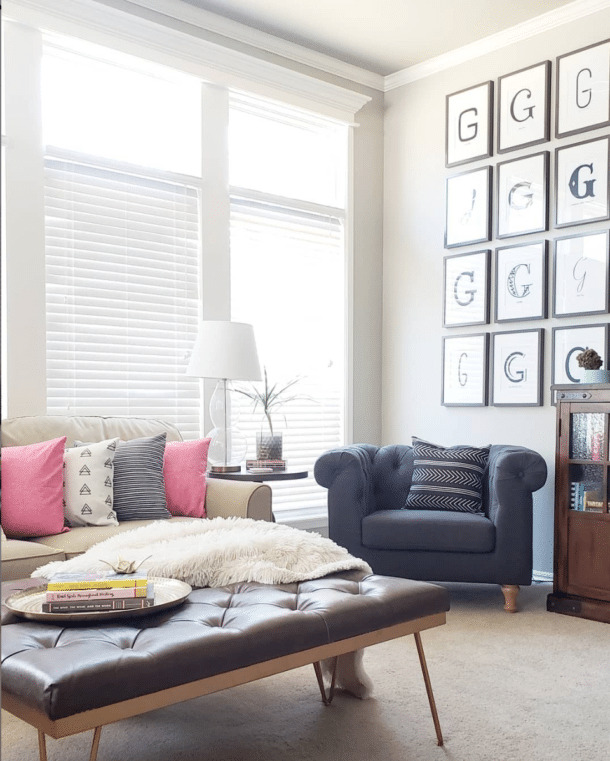 For more fast decorating & organizing ideas, check out the rest of the Fast Fix Friday series.